There are two stories about what ails business investment in the United States that I hear frequently, and at first blush, they seem to be in tension with each other. They’re not — and the connection between them leads to a different policy solution than is usually advanced by the people telling one story or the other. 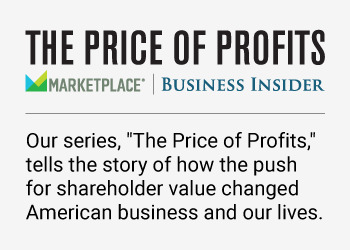 One, examined in a series on Business Insider this week, is that corporations have become too disinclined to reinvest their profits. Instead, they are sending cash to shareholders, often in the form of share buybacks, in a way that is destructive of long-run value. This is a story about equity capital being too eager to leave firms. The other, discussed for example in Josh Brown’s February article about “abundance,” is that low interest rates and quantitative easing have driven stock prices too high. Frustrated by low bond yields, investors are drawn to equities and willing to accept price-earnings ratios that do not appear sustainable. There is a parallel story on the venture capital side, with high valuations for private firms and free-flowing private capital that makes IPOs unnecessary, often for business models with no clear strategy to generate profits in the long run. These two stories seem, at first glance, inconsistent with each other. But I think they are both symptoms of a single underlying problem — a problem that is not driven by monetary policy, shareholder value ideology, interest rates, or share buybacks. a weak outlook for global economic growth. Population growth has slowed, productivity growth is low, and China’s catch-up growth is tapering off. In this environment, it makes sense that firms would reinvest less of their profits. Because of the bad outlook, they have fewer good investment opportunities per dollar of available capital than they used to, and they might as well send the excess profits from the existing business back to the owners. It also makes sense that long-term interest rates are low. Positive risk-free interest rates exist because people prefer money now over money later, but because capital is not scarce that preference is not as strong as usual. It also makes sense that valuations would be high, especially for firms with reliable income streams, and that investors would take gambles on frothy markets and fuzzy business models. Where else are they going to stick their money and hope to earn any profits? These are all symptoms of a real problem, and it makes sense that people are alarmed by them, but the world’s fundamental growth problems cannot be fixed by treating the symptoms. Raising short-term interest rates will not create the stronger economic growth conditions that would support higher long-term interest rates. Making it harder for firms to pay dividends and buy back shares will not give those firms good ideas about how to reinvest profits productively in a slow-growing economy. What would address all these symptoms would be a solution to the root problem: Policy changes that would improve the global economic growth outlook. If growth expectations were higher, firms would be more inclined to reinvest their profits in the business. Long-term interest rates would go up, and shareholders would be able to demand lower P-E ratios. The higher cost of capital would make venture capitalists more discerning and discourage bubbles. Unemployment would also be lower and wage growth would be stronger. On one level, what I’m saying here is obvious: more economic growth would be good. My point is simply that the core economic question the world faces today is a growth question, and it’s not going to be fixed through changes in shareholder policy or monetary policy. How to promote real economic growth is a complicated and difficult question, but here are three ideas that, if implemented, would make it easier for capital to find a useful application. China should reform its capital markets so investment performance is driven by the profitability of the underlying business — so capital in China is better directed to economically useful ends. And Europe should fix its economic imbalances, so southern European economies are no longer shackled by monetary policy that cements in place high unemployment and economic stagnation. All three of the above ideas are (in ascending order) extremely difficult to implement, and I don’t expect any of them to happen in the next five years. But they are the sorts of things that need to be done to improve global growth prospects. These sorts of changes, not corporate governance, are where I would focus my energy to improve global economic performance.